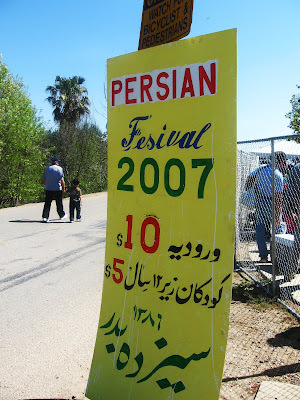 The 13th day of Norooz, aka Sizdeh Bedar, marks the end of Persian New Year celebrations. You’re supposed to get out of the house for good luck, and being that this year was the first that I wasn’t with the fam, I took myself to Jafar Panahi’s Offside (review to follow shortly), which was hardly an alternative but as close as I could get in the horrible rainy weather of New York. 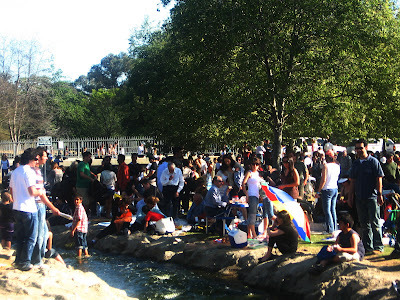 Luckily my kid sister, Armaghan, took some photos at Balboa Park’s annual gathering in LA’s San Fernando Valley yesterday (it’s always done on a Sunday, regardless of what the actual thirteenth day is) and “ja’amo khali kard,” as they say (rough translation: she saved a spot for me). Above is a man dressed as Haji Firooz, a jester-like character that gave me the creeps as a child. The rest of the photos are below, but be sure to scroll down to the end of the post for a video of the cutest dancing Persian grandpa you will ever see. 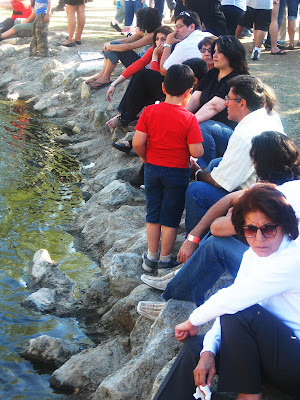 Intergenerational Persian chilling is what Sizdeh Bedar is all about. 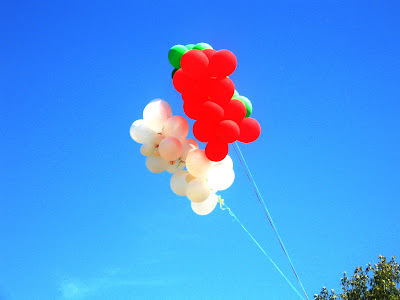 Green, white, and red – not only the colors of the Mexican and Italian flags, but also that of the Iranians. Mmhm. Welcome to the “Fesival.” They started charging for this thing last year, when some clever company got permits to host the event and started putting up fences and posting “security.” There was quite a hubbub at the gates last year, so I guess everyone’s given up and this company, whoever they are, keep cleaning up. Oh, really? 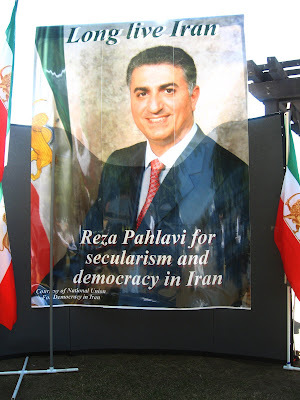 Interesting to note that someone who self-identifies as “Heir to the Throne of Iran” (see the description in the search results) would be touting democracy… interesting, interesting! Armaghan Saremi won her first photography accolades when she was 12 years old. She recently traveled to Mexico for a second time as part of a group building houses for impoverished families, where she photographed the mission. Armaghan has written for and edited her high school newspaper, and her essay about identity was published in the first-ever IAAB Javan Iranian-American Essay Contest eBook. She is heading to university in the fall.